Went to the Aquarium of the Pacific over the weekend with the family. My wife got the tickets for free at her employee health fair. Still paid for parking though but that wasn't bad considering we saved $74.00! I know that everyone tends to shoot the jellyfish but I couldn't help it. 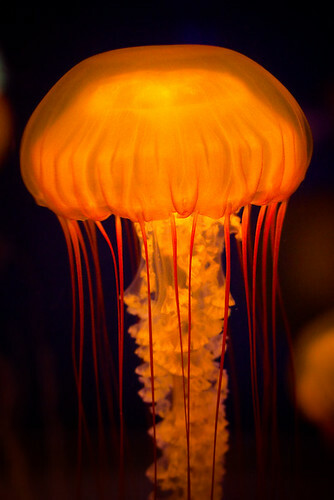 When the light from the aquarium hit them in a particular way they looked as if they were glowing, so surreal, so otherworldly! I had to take a shot, so I waited until at least one of them crossed my viewfinder... and then... Click!